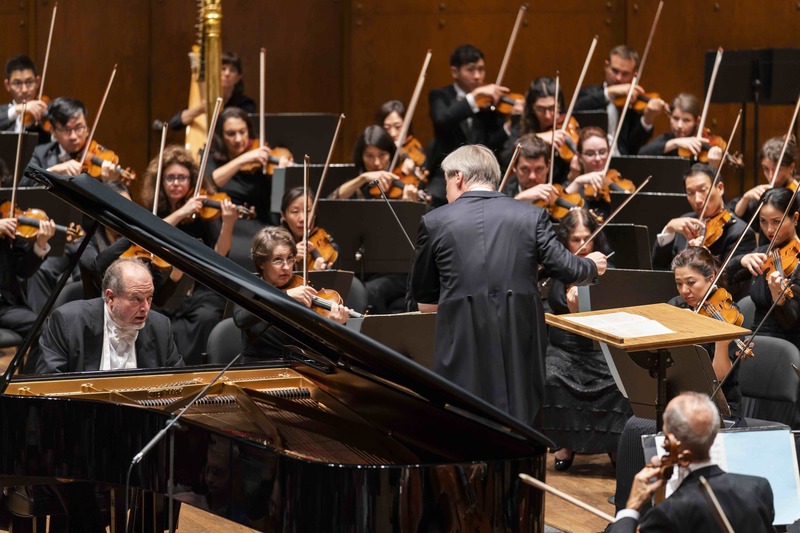 The New York Philharmonic is celebrating Louis Andriessen’s 70th birthday year with a series of events, including inviting the Dutch iconoclast to curate one of their new Nightcap progams (on October 13). This concert was an opportunity to hear an Andriessen rarity – his TAO for solo piano, voice and koto, orchestra and vocal quartet – alongside two mainstays of the repertoire: Rachmaninov’s Rhapsody on a Theme of Paganini and Sibelius’s ever-popular Second Symphony. I heard Robertson lead a dynamic performance of the Sibelius in Sydney two years back so I was looking forward to the second half, in which it’s fair to say he didn’t disappoint, but more of that anon. An 18-minute extended work, TAO sets texts that deal with the meaning and transience of life against a musical backdrop that though it doesn’t play any of the obvious ‘music of the Far East’ cards, conjures a certain Asian atmosphere through high string effects that suggest the reedy sounds of the Japanese shō and delicate percussive textures that seem to hint at Buddhist temples. The funereal choral words come from Lao Tzu’s 6th-century BC Tao Teh Ching (The Classic of the Way and its Virtue), while the soloist recites Knife-Whetter, a powerful poem by the 20th-century poet Kotaro Takamura, which hints at the futility of life while describing an artisan’s quest to hone his craft over the course of a lifetime. It’s perhaps atypical for Andriessen, in that it employs neither amplification (except for the voices, here an outstanding quartet from Synergy Vocals) nor does it include brass, aside from two horns. Beginning high on shimmering strings with pointillist harp and tinkling crotales, all is delicacy and unexpected rhythmic overlaps. Vocals are very close harmony indeed (often a tone or semitone apart). Another section sounds like wedding bells but as if sampled by Messiaen. The soloist was Tomoko Mukaiyama, who premiered the work back in 1996. Towards the end, she rose from the piano to take a slow walk, her flowing cream gown eerily reminiscent of grave clothes, eventually kneeling at the koto where she half-sang, half-recited Takamura’s poem. Robertson’s reading of this complex score was suitably precise and authoritative. The wonderful American pianist Garrick Ohlsson was the soloist for the Rachmaninov, a big bear of a man with a Horowitz-like heft to his playing. He had an almost insouciant way with the early variations, his sizable hands flitting up and down the keyboard, his touch light yet never at less than ample when it came to sonority. His natural gravitas played out in the more sombre variations, the Dies Irae sections benefitting from an air of solemnity. His dexterity in the fiendish solo passages leading into and out of the hyper-romantic penultimate section was most impressive, as was his spirited finale. 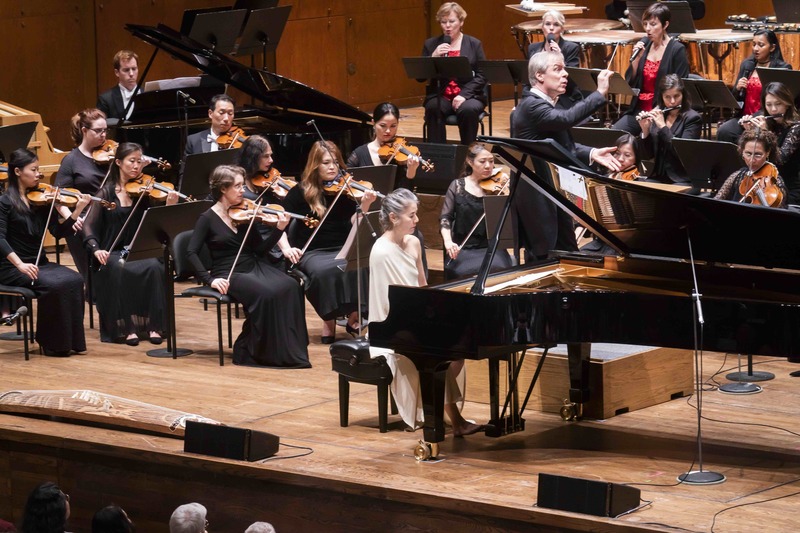 Robertson’s focus on balance, buoyancy and intricate cross-rhythms kept it all lightly sprung, the Phil producing a firm, brisk tone at the start and relishing the multi-hued colourations of Rachmaninov’s glittering orchestrations throughout. This was a most characterful reading, full of personality from soloist, conductor and orchestra, and the demonic frenzy, when summoned, was thrilling. The big tune was shaped just-so, the finish full of dash and vim. A really distinguished rendition. Ohlsson’s encore, Rachmaninov’s famous Prelude in C Sharp Minor, was a real barnstormer, earning well-deserved ovations. So, what of that much-anticipated Sibelius? Robertson combines a flexible, organic approach with a musical raconteur’s focus on storytelling. The composer insisted that the work has no program as such, but clearly something lies behind the endless ins and outs of this score, especially in the gnarly, elusive second movement. Robertson’s decision to push on without a break here was highly effective, as if the narrator of some Norse saga had simply turned a page and continued reading. The opening, punchier and more fleet of foot than is often the case, had a real lilt. Clearly, great attention has been paid as to how to fluidly negotiate Sibelius’s frequent gear changes. With warm string tone and dark, warbling strings and brass, the orchestra dug in and went at it hell for leather, although Robertson’s urgency must have challenged the odd player used to broader tempi. With a compelling imaginative grasp on the whole, this was a magical, organically inspired reading, every twist and turn of the tale held up for our comprehension, then folded back into the whole. Horns and low brass were hair-raisingly affecting in the Andante, Christopher Martin’s melancholy trumpet solo especially so. Sherry Sylar’s oboe solos in the chorale-like trios of the helter-skelter Vivacissimo third movement were also noteworthy. A powerful finale crowned this reading, the big entries never overplayed, yet not short-changed either. With a wonderful sense of dark to light, no wonder the Finns with their endless winters go crazy for this work. If anything, Robertson was even better than two years ago, his energetic and eloquent body language seeming to shape the music before our eyes. And how refreshing to hear something that you thought that you knew so well reinvented as a living, breathing organism. Master lutenist delivers Dowland's dolours, but with plenty of uplift and a tale or two to tell.